Good morning!!! Can you believe Christmas is only 3 days away? I got my Christmas present a week early and have had so much fun playing with my new toy!!! I am now the proud Owner/Mommy/Girlfriend/Slave to an INSTANT POT!!! I have been a member of several instant pot facebook groups for months so I have about 50 recipes already bookmarked to try as well as old favorite recipes of ours I want to adapt for the pressure cooker. But, the first recipe I made, I wanted it to be VERY SIMPLE, TRIED & TRUE, and DELICIOUS! Basically newbie proof. LOL! I decided to go with a variation of that infamous Mississippi Roast that everyone just raves about. The Instant Pot was absolutely MADE for cooking a chuck roast. The only difference in how I make my Mississippi roast and everyone else’s, is I prefer to use a soda (coke) as my liquid instead of the pepper juice. The sweetness of the coke really balances the tangy-ness from the other ingredients. I got the coke substitution idea from my friend, Mary, over at Deep South Dish years ago, and have never looked back!!! So the instant pot is just as magical and amazing as everyone has been raving about. I took a 3.5 lb chuck roast from raw to fall apart tender in about an hour. Mind>Blown. I am so looking forward to sharing more instant pot recipes with you guys! 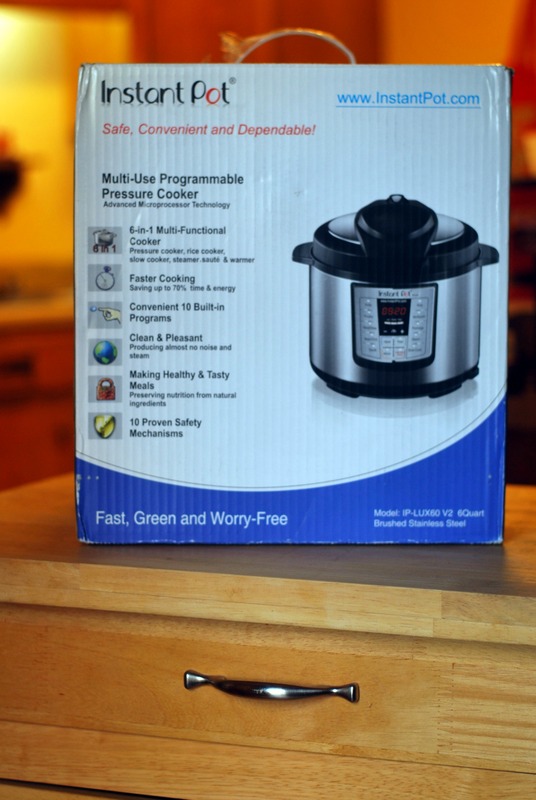 Click here to order an instant pot of your very own! After the roast has browned, place all of roast pieces back in the pot and sprinkle with ranch and au jus powder. Pour coke over and top with 6 peppers and the butter. Once the pot reaches pressure, it will begin counting down. Once it has finished it's cooking program, it will beep, then allow roast to remain in pot for 20 minutes NPR, for a natural pressure release. Release any pressure left at that time, removing roast to a platter and covering with foil. For the gravy: Combine cornstarch and cold milk and stir until smooth. Turn the instant pot to the saute fun. Stir the smoothed cornstarch mixture into the pan juices in the instant pot. Stir until thickened and serve over mashed potatoes! ENJOY! *I am not affiliated with Instant Pot in any way. I am an amazon affiliate so if you do order one from the link provided, a small percentage goes towards the blog! Thank you for your support! Wow that roast has me drooling! I’d love one of those instant pots too! I want an instant pot so badly! This roast looks amazing and that’s so awesome that it was done in under an hour! That looks delicious! I think I’m putting a insta pot on my birthday list. I don’t have an instant pot yet, but I’ll be getting one soon, so I’m researching recipes for it. This looks great! I guess I need an instant pot now! Now I am green with envy! I guess I thought an instant pot was like a slow cooker, but it’s the opposite huh? What a fantastic option to quick cook a meal! And your recipe looks terrific – win, win!! I cannot WAIT to use mine I got for Christmas!! I am totally trying the coke idea next time I make Mississippi roast! I made it exactly according to the recipe except for the Coke. All I had on hand was Ginger Beer. It wasn’t falling apart tender, but quite moist and tasty. Made this last night. I used a shoulder cut chuck roast so I added ten minutes to the cook time because it was thicker and didn’t have the marbling of fat as the normal chuck roast.. Followed directions exactly otherwise and this was so delicious!! My family loved it! Thank You! My family loved this, super easy and quick. I got my Instapot a few weeks ago and finally got brave enough to try a roast. I followed your directions and it was WONDERFUL! In fact, my two sons and 2 of their friends and myself polished it all off! I thought sure I would have another dinner out of it! Thanks so much. This is a definite keeper! This might be the very 1st recipe i try. Just got the instantpot for chriatmas. I am nervous to even start so i need to know when you say ‘Turn the Instant Pot to the Saute function and adjust to the HOT setting. While it is heating, cut roast in half or 4 pieces. Once pot is hot, add 2 Tbsp oil and brown roast on all sides’ do you turn it on without the lid on it? Do i have to pan fry it first to brown the sides of the roast first ? Yes, Josie. The saute function should be used without the lid. It’s basically like using a burner on a stove top. It’s great for browning meats prior to putting the lid on and braising your meat under pressure. That way you don’t have to pan fry on your stove in a separate pan first. It also allows those browned bits to stay in the pot for extra flavor. (Be sure to scrape any browned bits up after you add your liquid and before you put the lid on.) The saute function is also great for keeping liquids simmering at the end of pressure cooking so you can make a gravy out of the cooking liquids. It gives you the best of both worlds. Four stars! Tonight I am making this for the third time. My family LOVES it! I have never used whole pepperoncini, but the sliced kind in a jar. I don’t know if it makes a difference, but thought I would mention it.